Scroll down to read what they have to offer…….. 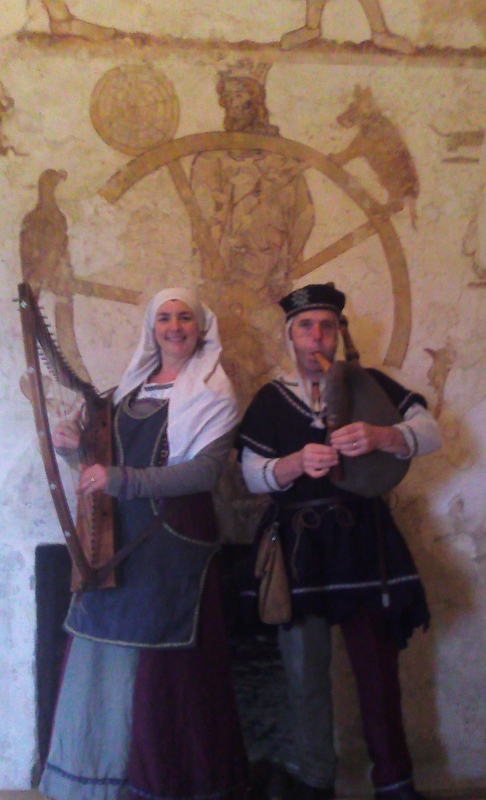 This programme of music covers the period of music just after the Norman conquest of 1066 up to the 13th Century. 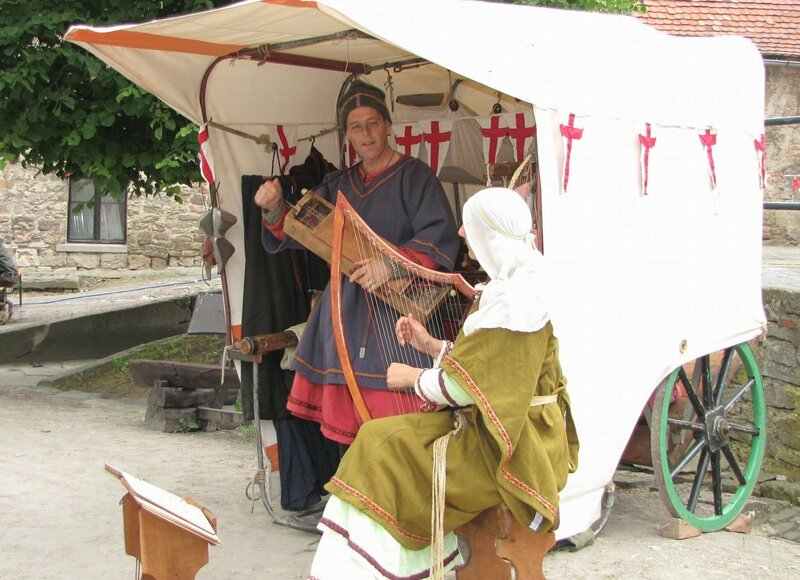 The first decipherable written music available to us today was invented by Guido Al Orezzo around 1020. Although not much survives from this period, thanks to the monks of the monasteries, there is enough to chart the progress of music from this early medieval period. Covering the first faltering steps of monastic chant through to the simple harmony of organum and on to the introduction of clausula and rhythm, the audience can learn, in simple terms, how the voices and instruments were used to play this beautiful and spiritual music. Organistrum, symphonie, harp, bells, dulcimer, claves and horn accompany the voices to present this soothing introduction to the world of medieval music. The musicians can also present a Christmas programme from this period of history – enchanting antiphons for this special time of the year. Read more on the Christmas page. Have you ever wondered where our English identity comes from? This is just one of the topics discussed in this programme of late medieval music. Hear how English culture evolved through the middle ages whilst covering technological innovations from the Crusades (Arabic) to the Renaissance (Italian). 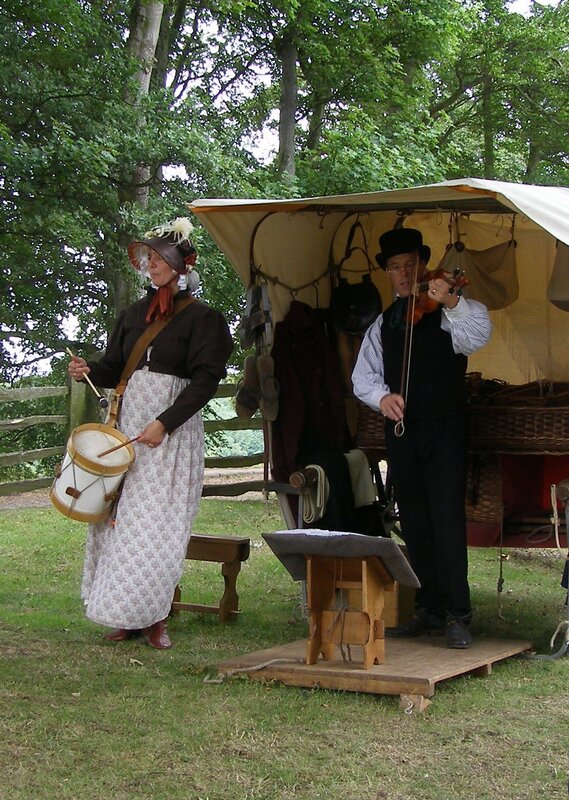 Hear how the English language was born and listen to the music and songs that tell the story. 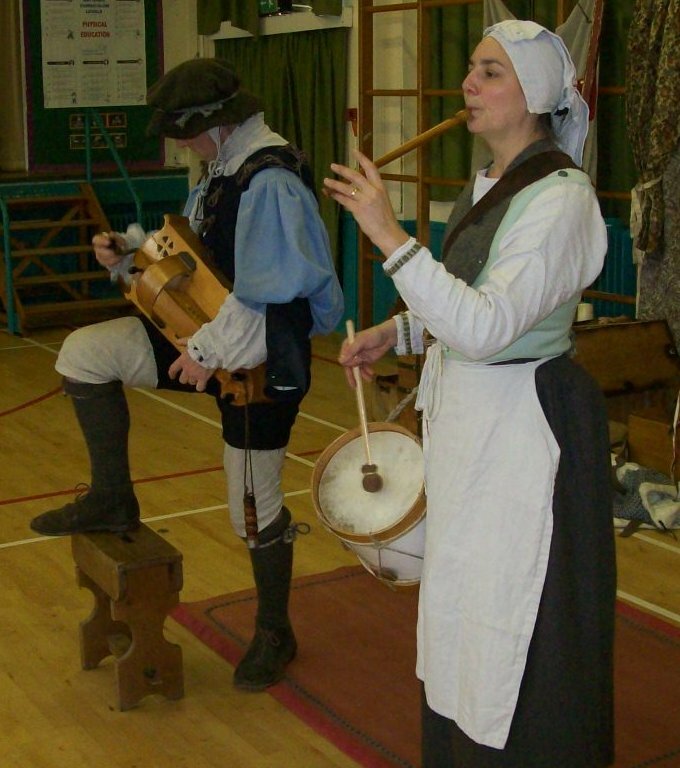 Instruments include bagpipes, pipe and tabor, hurdy-gurdy, clarion, uud, harp, flute, voices, rebec, bells, tabor, hautbois, nakers and bladder pipes. 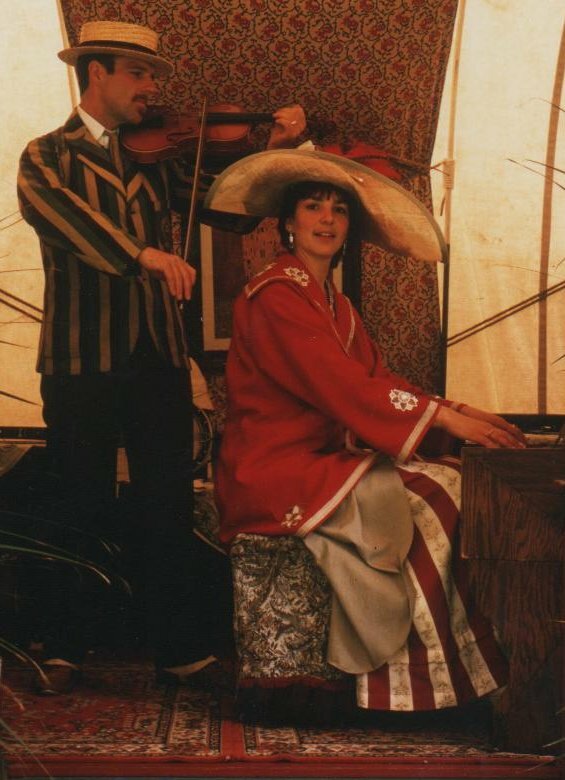 The music is taken from all over Western Europe and includes a wide variety of styles. With the availability of printed music, here we have the flowering of the story of music. This is reflected in the wealth of material for us to play. 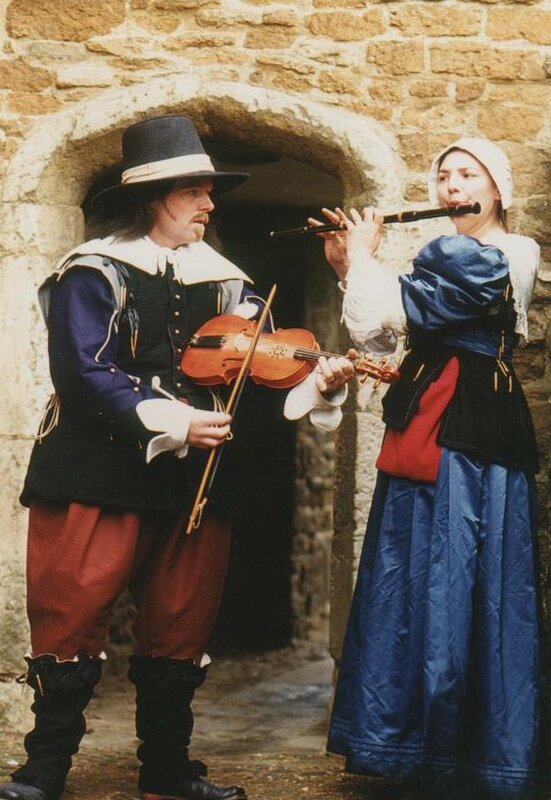 Consequently, the musicians can offer three programmes of music for the Tudor Dynasty. Beginning with the reign of Henry VII, on through Henry VIII, Elizabeth I and closing with the Border Rievers. 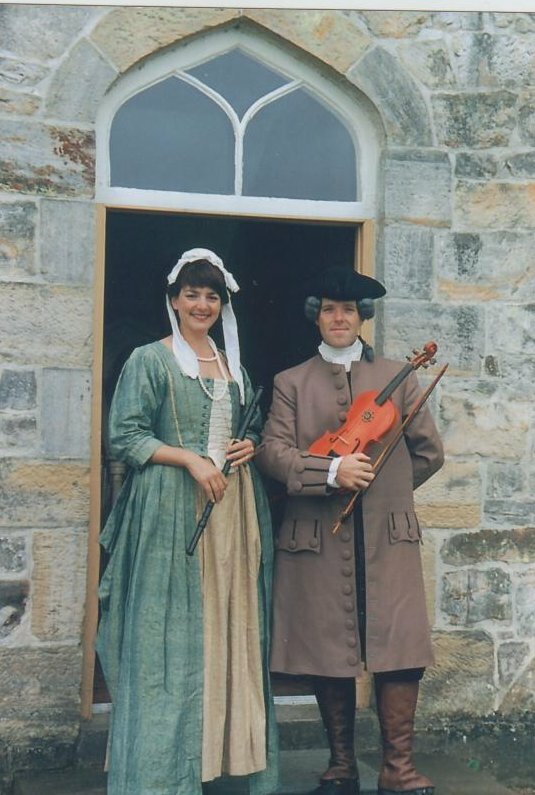 Each programme offers music and discussion on this active period of our history using newly introduced instruments such as sagbut, fiddle and zampogna bagpipes to add to the by now well known instruments of harp, tabor, hautbois, flute, pipe and tabor, and hurdy-gurdy. For this Tudor period, there is also a Christmas programme on offer. For more details visit our Christmas page. As the Tudor age closes with the death of Elizabeth I; and James VI of Scotland becomes James I of England; the music moves onwards towards the baroque period. 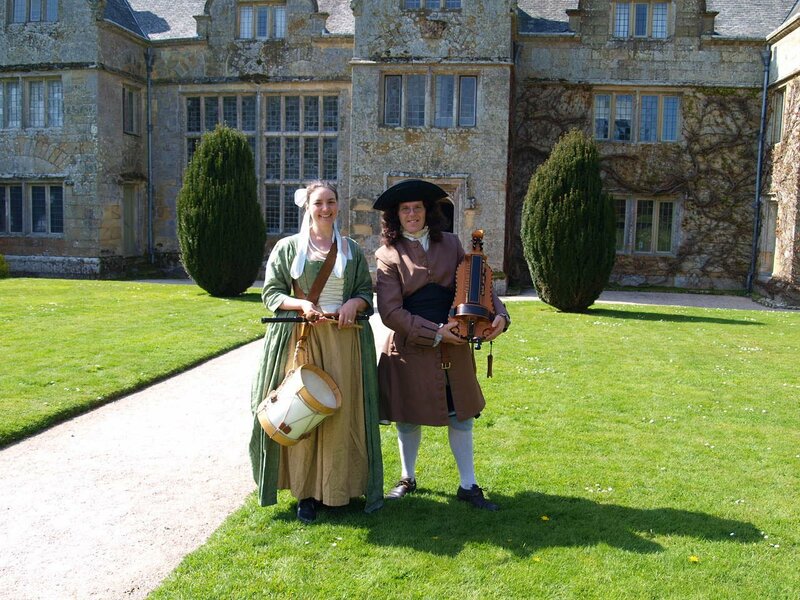 The instruments steadily develop; for example, bagpipes can now be fitted with bellows so can be used to accompany singing, and some of the finest music can be heard in the form of consort music and love songs. This is an ideal period for a wedding celebration with so many fine songs to celebrate love. Visit the weddings page to find out more. 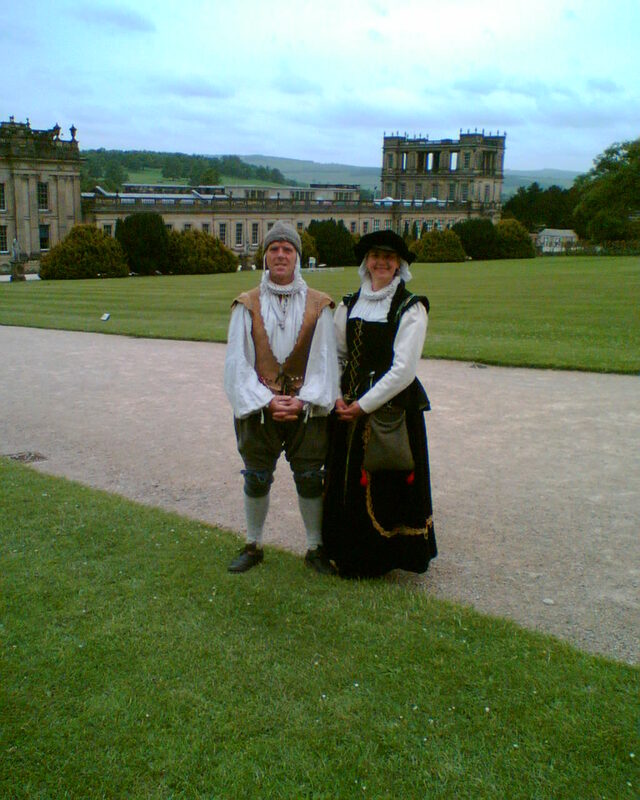 The English Civil War includes consort music, dance music and ballads that express the feelings of those alive at the time of this civil unrest. Robin Hood – myth or legend? 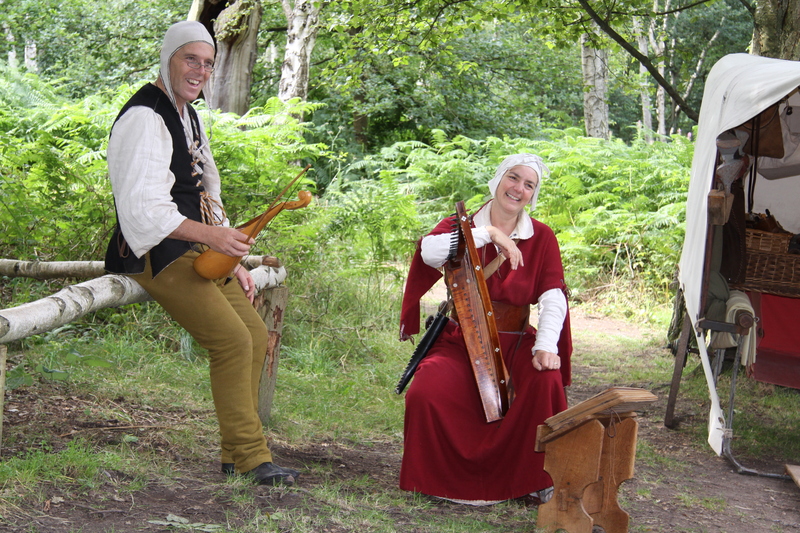 Here is a performance of songs written down in the 17th century when the stories of Robin Hood were popular. Restoration of the Crown – Charles II. The Merry Monarch was fond of his entertainment and the instrumental music, dances, and ballads of this time reflect this peaceful historical period. William and Mary bring this century to a close and with characters such as Henry Purcell, Inigo Jones, and Playford we discover the joy of bawdy humour in music from this episode of history offset against the worries of the religious wrangling! 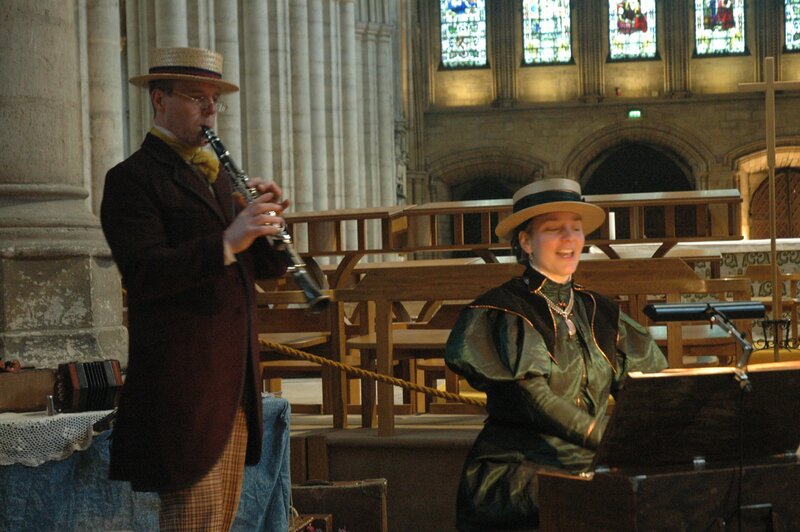 The theme running throughout these programmes is the gentle music of the gentry set against the soldier’s songs of war. This presentation includes rounds and arias from composers such as Eccles, contrasted with the robust hautbois and sagbuts of Jeremiah Clarke. All this interspersed with popular songs of the Redcoats, including ‘Over the Hills and Far Away’, ‘Down Amongst the Dead Men’ and ‘The Grenadiers March’. Jacobite and Georgians. This programme is a political journey in music describing the struggle between the newly elected Hanoverians and the exiled Stuart line. This is an emotional look into the time of the ’45 rebellion. ‘Drums along the Mohawk’, 1759. Here we have a musical story beginning with brave General Wolfe and the capture of Quebec. The story finishes with French and Red Indian music from eighteenth century Canada. Americas Dream comes true in 1776. Here is a look at the songs and music depicting the struggle for American independence from the British Empire. The programme balances tunes popular in Britain at that time, with the songs of the American rebels. The eighteenth century provides extensive repertoire for a Christmas programme. Visit the Christmas page to find out more. The classical early 19th century sees the time of the Prince Regent. James Hook is writing charming songs to entertain in the Vauxhall Gardens in London whilst the wars rage on abroad. Shortly before the Regency begins, Nelson falls at Trafalgar in 1805. Later, in 1815, Wellington is victorious over the French at Waterloo. This programme discovers the music and songs from this time of contrasts. Never before in history has the music of the ordinary people taken such a leap forward as with the invention of the metal reed instruments at the time of Queen Victoria. This revolution gives the world the concertina, the harmonica, the harmonium and the accordion. All the above, as original or replica, instruments are used in the following programmes to chart the reign of the longest serving monarch in our island’s history. 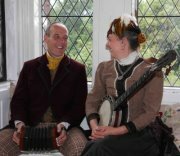 These instruments are added to by another Victorian innovation, the banjo, and recently redesigned earlier technology such as clarinet, oboe, violin and percussion. Victorian Maritime history is rich, and so are the songs to go with it! Songs about the Queen’s navy, the Plimsoll line the Barbary Coast and much more are included in this mid-nineteenth century presentation. 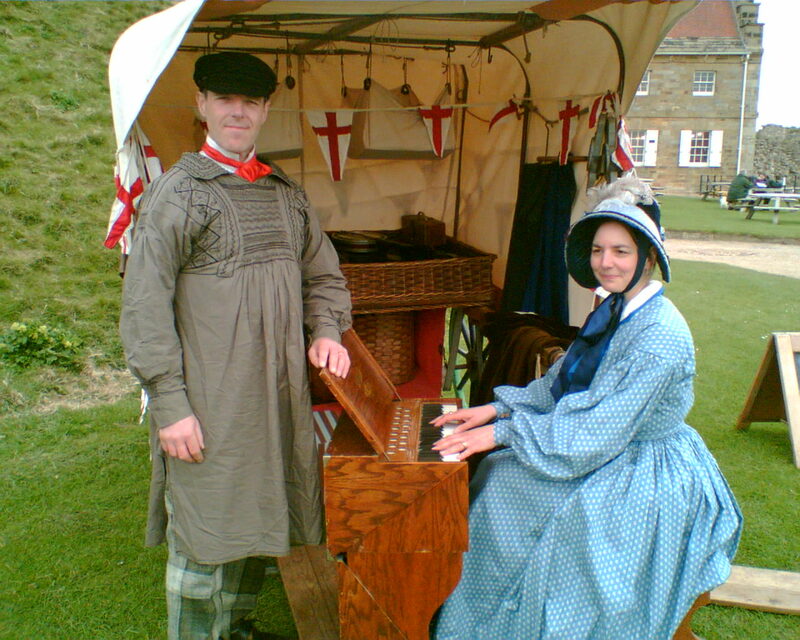 Victorian Traditional St. Georges Day. Early Victorian folk Agriculture songs. Early Music Hall- songs from the dawn of music hall; the 1843 Theatre’s Registry Act. The Naughty Nineties says it all! The music hall is at its height in the 1890s and Edwardian times. In this presentation we have everything from rampant patriotism to evergreens, songs from the shows, sickly sentimentality, comedy and woe. This programme includes a song board for audience to sing-a-long with all the music hall songs that everyone knows. For a seasonal variation, visit the Christmas page of this web-site for our Victorian Christmas option. With tango and ragtime all the rage, hobble skirts for women and the Women’s Social and Political Union there’s much happening in this decade of the early 20th century. Set against the backdrop of the Great War, here is a stirring account of the trials and tribulations of a generation thrown headlong into 20th century technology. The songs say it all. This is a period presentation of the songs of the Trenches. 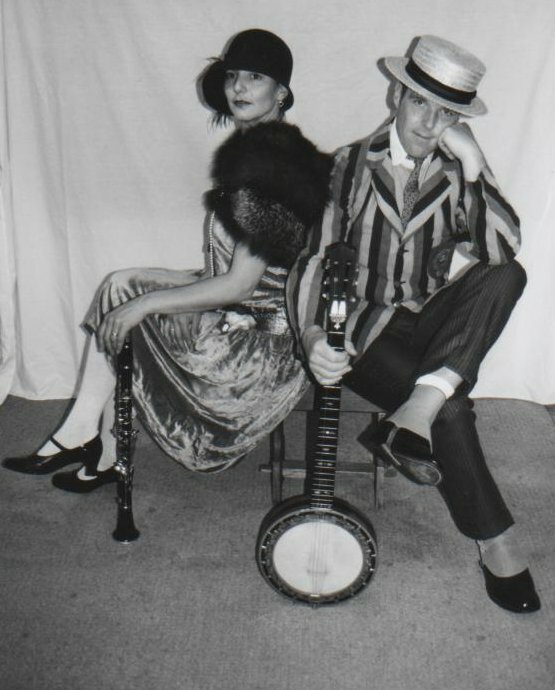 My Razz-Jazz Band transports us to the era of the Flapper, calling on Da Silva, Brown and Henderson, Fats Waller, Hoagy Carmichael, Cole Porter, Noel Coward and others to help us beat the Blues. I first saw you perform at Pendennis Castle back in 2001 and thought you were great! I purchased your CD called Haloriana and loved it however it has since gone missing. Is this still available to buy? We no longer sell cds but you can click on the links on the ‘Listen to our Music’ page to hear what we sound like. Just found out about you via a facebook group. I am fascinated by your outdoor cart. What did you use as a base? In am looking forrwad to hearing from you. The wagon was really just a Stage. The base was 3 pieces of 8ftx4ft half inch plywood on a 2”x4” wooden frame. This made the wagon 12 ft long by 4 ft wide. It bounced a bit when we played but was safe as houses for 25 years!